Rockland and Unity, ME — Famed photographer William Wegman, known worldwide for his witty and strikingly human photographs of his Weimaraners, has created an exclusive limited-edition print to benefit two Maine nonprofits, the Maine Organic Farmers and Gardeners Association (MOFGA) and the Center for Maine Contemporary Art (CMCA). 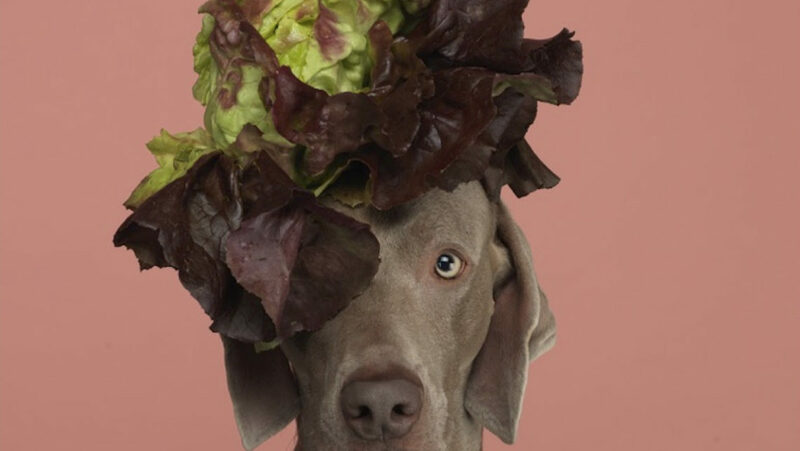 Titled, “Topper,” the 30 x 24 inch print, produced in an edition of 10, pictures Wegman’s dog Topper seated against a coral pink background and wearing a “wig” of curly leaf lettuce. A classic Wegman image, each print is $8,000, and is individually signed and numbered by the artist. The full purchase price of each print directly supports MOFGA and CMCA equally. The Center for Maine Contemporary Art (CMCA) is a contemporary arts institution presenting year-round exhibitions, engaging events, and educational programs for all ages. Founded in 1952, as Maine Coast Artists, CMCA is the longest running institution dedicated to contemporary art in Maine. In June 2016, it moved to a new building in downtown Rockland, Maine, designed by award-winning architect Toshiko Mori. Below: William Wegman, “Topper,” 30 x 24 inches, limited edition print produced by the artist to benefit the Center for Maine Contemporary Art (CMCA) and the Maine Organic Farmers and Gardeners Association (MOFGA).